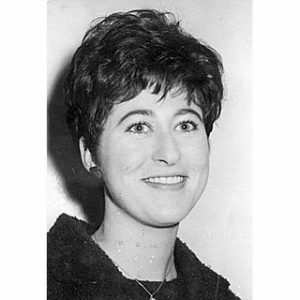 Dr. Veronica Ann Mary (Clough) Vaughan was born in Canterbury, England on the 2nd of April, 1942, the daughter of Colin Clough and the former Margaret Reynolds. She graduated from Durham University Medical School in 1965. Dr. Vaughan married Dr. George Ernest Ryan Vaughan on the 3rd of September, 1966 in Yorkshire England. Dr. George Ernest Ryan Vaughan was born in Madras, India, the son of Dr. Ernest Vaughan and the former Thelma Carvalho. Dr. George Vaughan graduated B.A. from Cambridge University in 1958 and he graduated MBB CHIR in 1961 from Cambridge University. Dr. and Dr. Vaughan immigrated to Canada in 1968. She completed her residency in 1969 at Queen’s University in Kingston. Dr. George Vaughan became a research fellow in surgery at Queen’s University. Dr. and Dr. Vaughan settled in Wallaceburg in 1978 and she specialized in anesthesia. Dr. George Vaughan became the Chief of Surgery at Sydenham District Hospital in Wallaceburg. 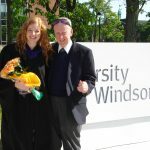 Dr. Veronica Vaughan was a strong advocate for the handicapped and she was a member of the Accessibility Advisory Committee of Chatham-Kent and she served on the Board of Community Living. She herself lived with multiple sclerosis. 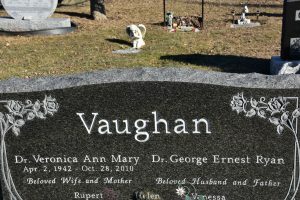 Dr. Vaughan was the mother of three children Rupert, Helen and Vanessa. Dr. Vaughan died on the 28th of October, 2010. 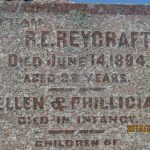 She was buried at Riverview Cemetery in Wallaceburg. 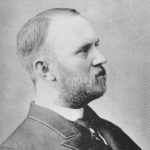 *Her husband Dr. George Ernest Ryan Vaughan also appears on the Chatham-Kent Physician Tribute website. Howard J. Rees Learning Centre.